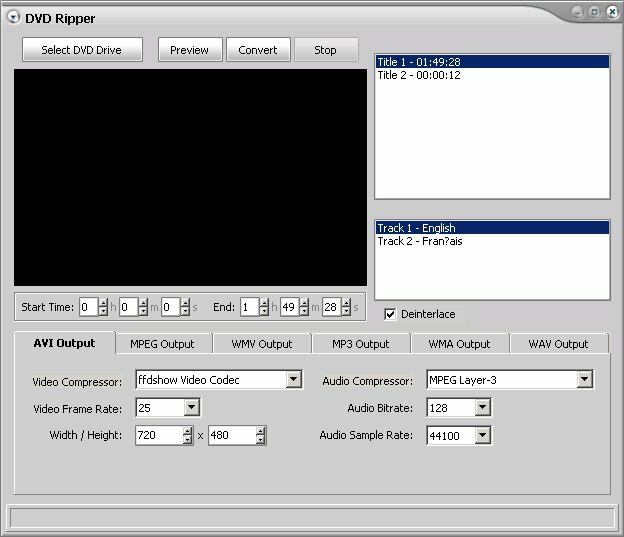 Blaze Media Pro offers an easy-to-use feature for extracting (ripping) video and/or audio content from DVDs. This feature of the software can be accessed from the Conversions / DVD Video menu. It allows DVD video to be ripped to AVI (using any compression codec, such as DivX, XviD, etc. ), MPEG-1, MPEG-2, and WMV, and DVD audio to be extracted to MP3, WMA, or WAV format. Full output control is available, such as outout resolution, bitrate, etc. for those who want to take advantage, but optional for those who perfer ease of use, with high-quality default settings. Video and/or audio can be ripped from a given title as a whole, or any desired range. For example, if you only want to rip the first 30 minutes of a title, simply select 30 minutes for the End time. Related Topics: Convert Video to Flash SWF, AVI MPG WMV Video Compression, Song Lyrics, Digital Video Editing, Audio Recorder, DivX Converter, Audio Effects, MP3 Ripper, WMA Ripper, MPEG Editor, AVI MPG WMV Video Joiner, MP3 Burner, Burn DVD Movies.